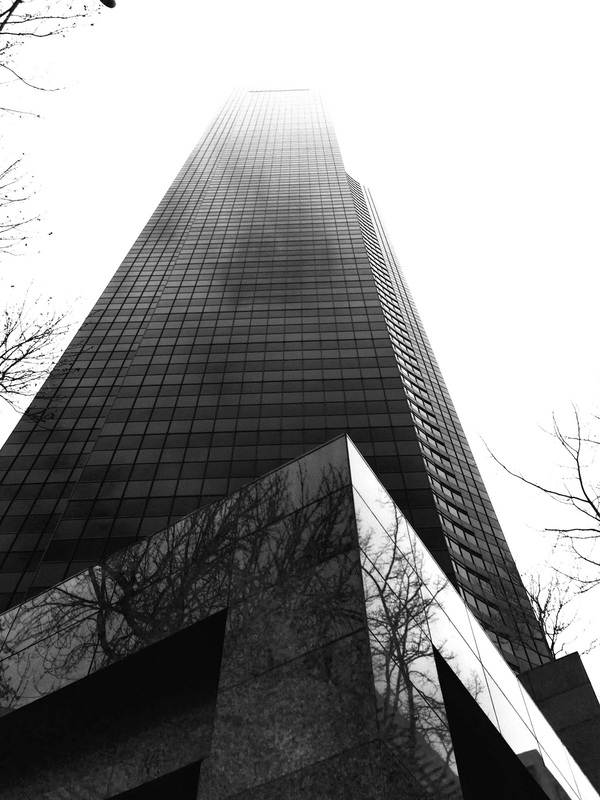 The tallest building in the State of Washington is the Columbia Center in Seattle. 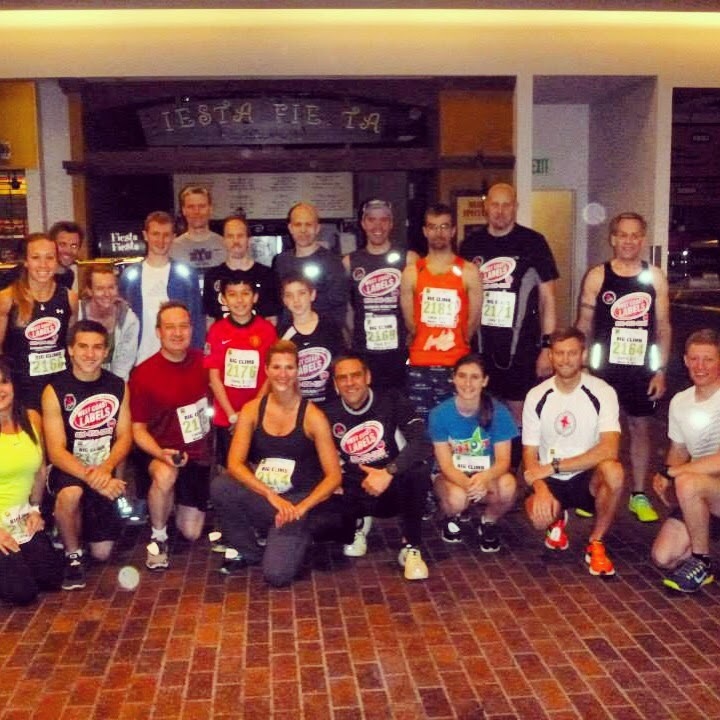 On March 23, 2014 I joined 6000 other people in “The Big Climb” race to the top of the building making Washington the 11th state I have ran the stairs of the tallest building in. This race is on a Sunday morning so I booked a 6:15 pm Saturday evening flight out of Utah to Seattle followed by an 11:00 am Sunday morning return flight. It is a quick trip but knowing I will be away from home a lot over the next three weeks I need to spend as much time with my family as possible. My son had his first golf tournament of the year Saturday afternoon and the tee time was set for 3:17 pm 45 minutes south of the airport. I was very disappointed when the times were posted since I love to caddie for my son. After getting lost driving for 2 hours to find the golf course we made it to his tournament and I caddied for the first 3 holes and he was doing great. My brother in law came and swapped me out so I could get to the airport. My son ended up taking 4th with a few triple bogeys that hurt his round but I am super proud of him. I arrived at the airport just in time to board my flight and was off on my trip. The flight to Seattle is a nice short 90 minute flight and the views on a clear day coming into Seattle are breathtaking with the snowcapped mountains, lush green forest that leads to the ocean and many bays. I have lucked out that every time I have been to Seattle it has been sunny. I rented a car and began the drive to downtown Seattle while driving past the large Boeing air field. 35 years ago my father had a job offer out of college to be an engineer at Boeing in Seattle and I sometimes think how different my life would have been if he would have taken that job and placed our family in here. I don’t know exactly what point of the highway it was but I came around a bend in the road and there was downtown Seattle towering in the distance. There was the Columbia Center towering over all of the buildings and my heart kind of sank and I said out loud “WOW”. I don’t know if it is due to the building being on a hill and the ocean being close but considerably lower, but I was intimidated! 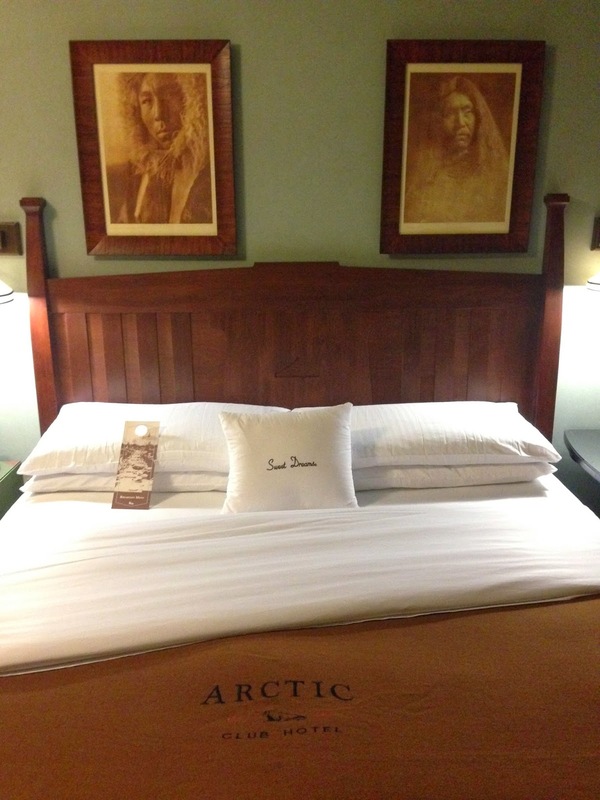 My bed at the Artic Club. Eskimos. 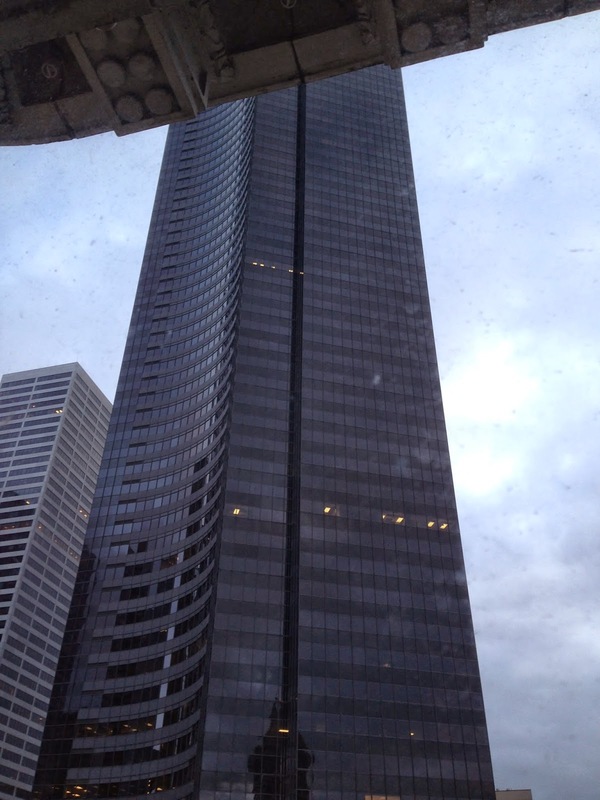 I booked a Hilton Doubletree called The Artic Club that on the map looked close to the Columbia Center. When I arrived and parked on the side of the street it was funny to see that the building is actually kiddie corner from the hotel. This Artic Club is very unique with a wall of old pictures of people and a shelf full of top hats. Maybe my favorite part of it was the white tall glowing polar bear in the lobby. Being a Hilton Honors member I always seem to get upgraded and have in my profile to stay in a room on a high floor away from the elevator. They put me on the 9th floor at the end of the hall in the corner. 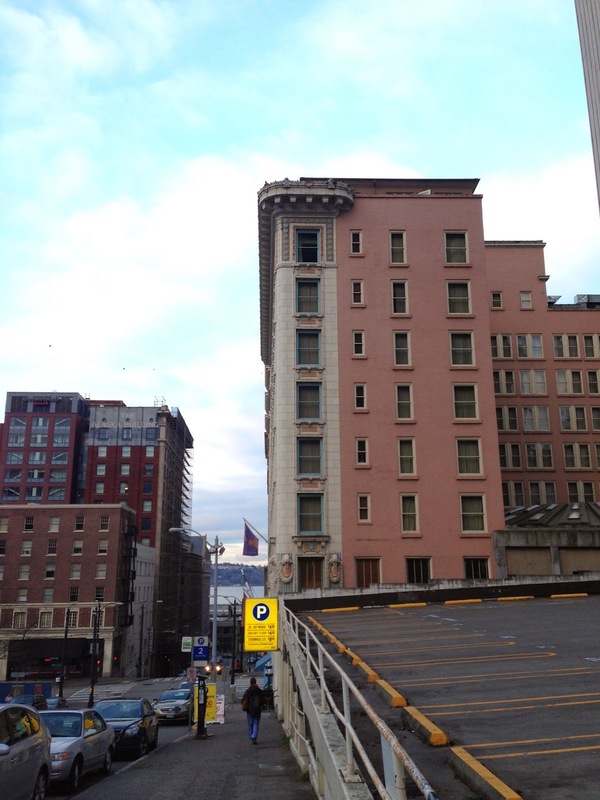 Funny thing about this spot is out of the corner window was a direct view of the Columbia Center. I opened the window, stuck out my head and couldn’t even see the top of the building. Intimidated again but laughing at how perfect not only the hotel was but the room. I’ve posted before about the president of the US StairClimbing Association is PJ Glassey. He owns a gym in Seattle called XGym and specializes in stair race training. He has a great website with tips for getting into this crazy stair racing world and is often featured in articles as an expert. He invited me to register for the race on his XGym team. This team wins the race every year and also gets to begin the race first at 8:30 in the morning. While I am nowhere near as fast as these guys it was an honor to run on their team and I made sure to position myself at the back of the line so they wouldn’t have to pass me. After a team picture we lined up and started the race. The stairwell is tight with 8-10 steps before hitting each platform and turning. It started on the 4th floor and ended on the 72nd floor so is actually a 69 story climb. At the starting spot before entering the stairwell there is some strange artwork with these bodies of people and rather than having a head they have a ladder that another guy is climbing on. 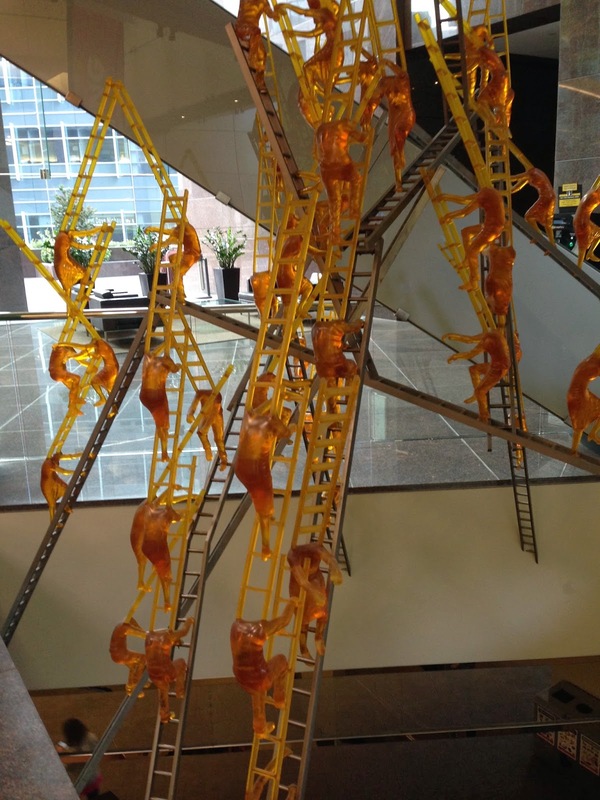 One of the strangest pieces of art I've ever seen. I made it about 15 floors with a quick jog until I needed to skip steps at more of a walking speed. It was honestly a tough climb. Around floor 35 some negative thoughts started to creep into my mind when I realized I was barely halfway there. I didn’t let those thoughts stay in there long as I began to think of my niece Whitney who cannot walk and how I have this body that is very tired but capable of doing this. It was a dark dusty concrete filled stairwell, I didn’t have any headphones on so I only heard my breath and feet plodding along but I began to feel very grateful in my heart to be at this place at this moment in my life. This gave me the focus to keep pushing myself floor by floor. I hit the top floor in 12 minutes 45 seconds, grabbed a water bottle and found a place on the floor to fall down to let my heart pounding sweaty body cool down. After relaxing for a few minutes I stood up and could not believe the beautiful view out of the windows. One window I could see the space needle, out another was the Seattle Seahawks football field and out the other was Pikes Market and the harbor. What an amazing sight and if you are ever visiting Seattle on a sunny day I highly recommend taking the elevator (or the stairs:) to this viewing room. The final results of the race placed me as the 89 fastest out of 392 males 30-39 years old. I was confused at the preliminary results that listed only around 3300 racers. The website proudly lists this race as the biggest in the US at 6000 racers. Thanks to PJ's article on the US stair climbing association website I learned that 2000 of the racers are non timed. Another 700 racers simply started the race and didn't finish. They must have stopped at one of the many water stops and took the elevator down. It really is one of the toughest buildings I have run and reading the article about elite climbers having a hard time it makes me feel a little better about my "wall" I hit at the 35th floor. I took the elevator down, went to my hotel to shower and drove to the airport to catch my flight. I made it to the gate just in time to board. The view flying out was spectacular as usual. Looking down at the city skyline from the airplane I felt grateful for this experience and the memories this goal is providing me. My body feels healthy my mind is clear and I feel in a strange way like this goal is making me a better person. The next couple of weeks I will be travelling to Kentucky, Indiana, the Philippines and Guam. 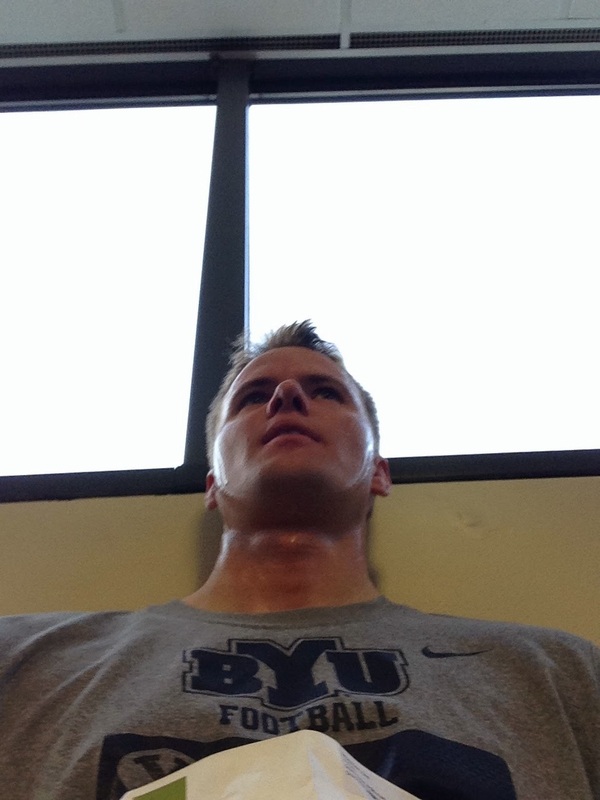 I hope I get the opportunity to run some more stairs and will post about it when I do.